Defra allows the Captive bolt gun to be legal for the destruction of dogs. Greyhounds are mass bred for the racing industry, so many that it would be impossible to rehome them all. So do we need to focus on the root of the problem rather than the individuals who kill? is given the fluffy name of pistol euthanasia. A KNACKER’S yard that supplies meat to the greyhound racing industry also has a sideline in slaughtering dogs that are no longer fast enough to race. An investigation has found that Holts, a company in Hertfordshire that has been slaughtering animals for 100 years, charges £20 each to put down unwanted greyhounds with a bolt gun and dispose of them. Staff said they did it for “quite a few trainers”, who visited the yard most weeks. “We shift a fair bit of stuff,” said one. The corpses are incinerated. Horse meat butchered on site is sold to the trainers as dog-food. Holts boasts that dogs fed on its flesh have gone on to become champion racers. They include a former winner of Greyhound of the Year. The reporter was also provided with meat by his staff. Food and Rural Affairs (Defra) said it was illegal for knacker’s yards to supply animal feed to anyone who had not been approved to receive it by Animal Health, a Defra agency. Greyhound industry rules state that dogs should be put down only as a last resort and always by a vet, who would charge about £60. 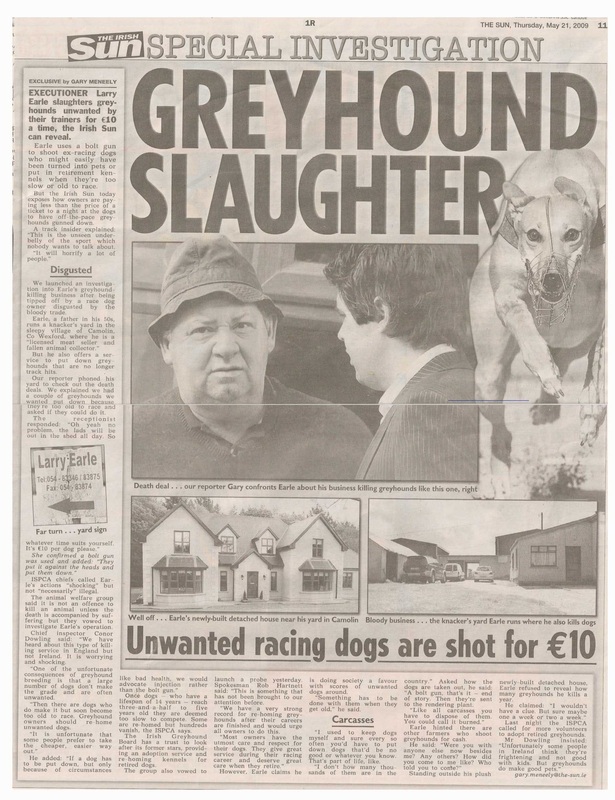 The issue of greyhound welfare was given national prominence when The Sunday Times revealed in 2006 that David Smith, a builders’ merchant in Seaham, Co Durham, had killed thousands of unwanted greyhounds for trainers. Lord Lipsey, the Labour peer, who is chairman of the British Greyhound Racing Board, said afterwards that it had been an “isolated case”. However, despite a wide-scale reorganisation of the industry, the killing continues. An undercover reporter contacted Holts after receiving a tip-off that the family-run business was routinely slaughtering unwanted greyhounds from nearby tracks. Waller’s son, Matt, described his methods. A sign outside the knacker’s yard – down an isolated track outside the village of Stanstead Abbots, near Ware – boasts that Fire Height Dan, greyhound of the year in 2004, was raised on its meat. Staff explained that they typically took in “fallen stock” such as dead or crippled horses before selling the meat to greyhound trainers and zoos. Anything unfit for animal consumption was incinerated on site. 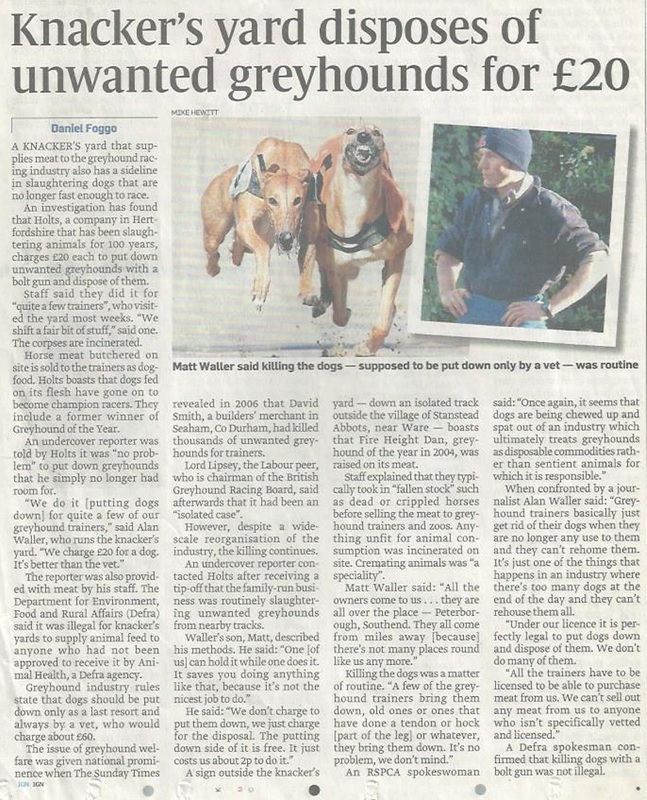 When confronted by a journalist Alan Waller said: “Greyhound trainers basically just get rid of their dogs when they are no longer any use to them and they can’t rehome them. It’s just one of the things that happens in an industry where there’s too many dogs at the end of the day and they can’t rehouse them all. “Under our licence it is perfectly legal to put dogs down and dispose of them. We don’t do many of them. A Defra spokesman confirmed that killing dogs with a bolt gun was not illegal.